The SESAM AMDOCS Cyprus configuration provides a solution for the SESAM Access Control configuration. It allows connecting several access-control controller loops. Each loop contains 8 controllers and each controller has 2 readers connected to it. 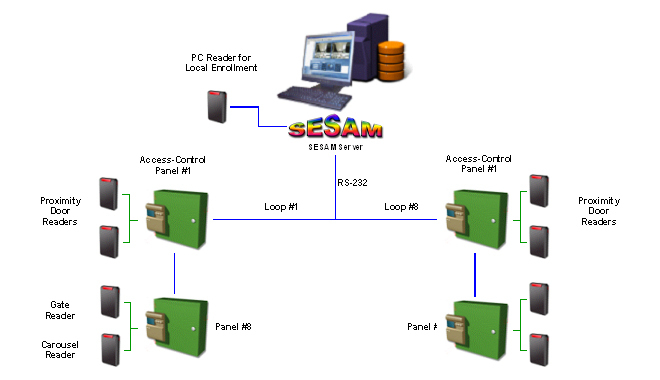 The enrollment reader is connected directly to the SESAM unit . The system operator defines the new cardholder in the software database, or updates existing cardholder data, sets the access level to the person, and uploads the data to the controllers. The uploading action takes a few seconds and afterwards the tag is valid for use according to the access levels.